Lately I've been having something of a love affair with Clarins skincare. I'll admit, I've had flings with this brand before, but after trying this trio of skin-pampering products, I am head-over-heels in love, and most definitely in it for the long-haul. Whilst I am a fan of the cheaper skincare brands out there, there is nothing quite like the feeling of using a luxe skincare product to really preen and pamper your skin. I'm more inclined to invest in 'high-end' skincare as opposed to makeup products as I know it's working magic on my skin and I don't really think you can put a price on that. So, I thought it was about time I gave you a run-through my current favourite skincare products from Clarins, as the three products combined have been working wonders for my skin lately. I've always been the type of person who thinks that toner isn't really the most important thing when it comes to skincare, and so I've either opted to skip that step or buy a really cheap toner to see me through. However, when I did a bit of research into Clarins' Toning Lotion with Iris, I was immediately sold. Designed for combination or oily skin, this toner is a total treat to use. It smells incredible, and leaves my skin looking and feeling great. The best (if not slightly startling) thing about it is that it removes so much more dirt, makeup and grime than cleanser alone. I cleanse my skin and use this afterwards, and it's always guaranteed there will still be muck on my cotton pad that my cleanser failed to get off, but this toner totally excels at. This toning lotion from Clarins has most definitely become a staple in my skincare routine. I'm well aware that I've harped on about this product several times before in both blog posts and videos, but it is just that good. The ultimate luxurious pampering treatment, the Lotus Face Treatment Oil from Clarins is another product that has become a staple in my routine, and that I will be rushing out to repurchase as soon as it runs out. This oil works incredibly well to smooth and nourish my oily skin, leaving it looking completely glowing the morning after using it. It, like the Iris Toning Lotion, smells incredible too and I honestly wouldn't be without it now. It's definitely pricey at £32 for a bottle, but a little bit really goes a long way and I've been using mine daily for months and it's still going strong. 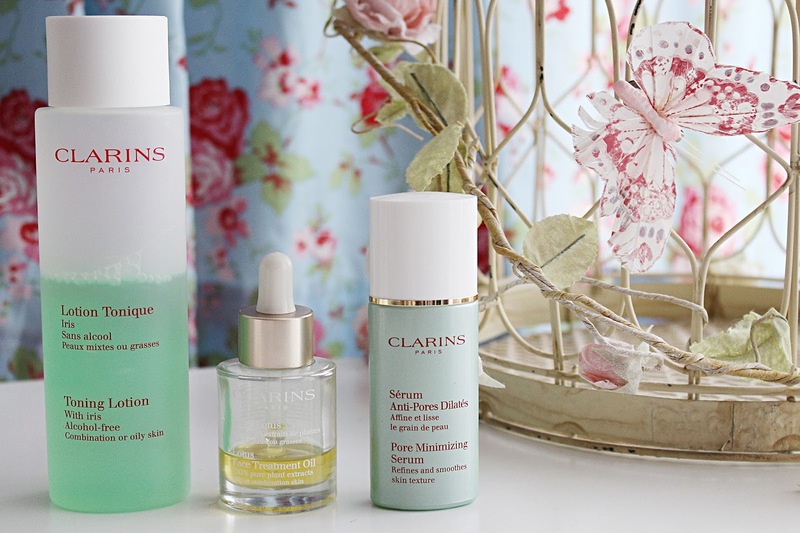 Finally, a fairly recent addition to my skincare routine (and growing Clarins collection) is their Pore Minimising Serum. As you'll have seen in my previous post on pores here, enlarged pores are a big problem for us oily-skinned gals and so I'm always keen to try different pore products to see how they fair. This product from Clarins is actually the first serum that targets pores that I've come across, and I'm really impressed with it so far. It's incredibly light in texture and therefore doesn't feel heavy on the skin at all when applied, unlike other serums I've tried. It has definitely made a difference in tightening and minimising my pores, and it is incredible when it comes to smoothing out the skin's texture. It's another thumbs up for this product from Clarins. I honestly couldn't be without Clarins in my skin regime at the minute - it is improving my skin no end and all of the products are a total pleasure to use. I'm extremely excited as Clarins have a sale on at the moment and there are some total gems in there. If you fancy signing up to the Clarins newsletter just click here, and you'll be first to hear about their sale previews. Are you a fan of Clarins skincare?